There are two ways to grow your business. Spoiler alert: It’s not the hard way vs. the easy way. You can scale up with strategy and intention–preparing yourself mentally and fiscally for the big dreams you want to bring to life. Or you can do what I did. Land your first client and quit your accounting career at a large engineering firm. In truth, while it looked like I jumped ship without a lifeboat, I knew my family and I were ready to take my side hustle to a full-time business. But how will you know when you’re financially ready? Great question. Let’s jump right in. Take a look at your bookkeeping reports, both personal and business. Are you making enough money to supply your needs for at least three months? While we can’t advise on what that magic amount might be (without seeing your books, of course), you want to have enough to cover operating expenses even if you don’t increase your revenue for a few weeks. Also, consider additional expenses you may encounter when you go full-time. For example, do you plan on hiring a virtual assistant? Or investing in brand strategy? Even if you cut back on frivolous spending, you don’t want your finances to limit your ability to scale up. Whether you’re in the black or red, the mark of a successful entrepreneur is paying your best employee (psst..that’s you). If you did the first step in this post, then this part should be easy. You know your budget, so all you have to do is factor the value of your work into that. Notice how I said value and not just salary. Your expertise and the time you spend running your business should be compensated appropriately. And if you were back in the corporate world, your employer wouldn’t say, “I’ll pay you when I can.” So, neither should you. Add your pay into your business plan and commit to doing it, whether biweekly or monthly. I know what you’re thinking. Thanks, Captain Obvious. 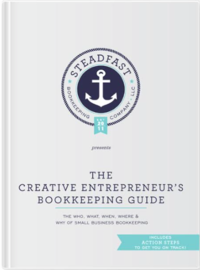 But it surprises us how many creative entrepreneurs don’t prepare for the amount of bookkeeping required to grow a business. Not preparing yourself to run a full-time business can lead to stress and burn-out. But we understand it can be confusing to know when (and how) to make the next move. For our customers, keeping tabs on their business’s’ financial health is as easy logging into our online portal. You can read more about that on our FAQ page. What other components are you focusing on to know if you’re ready to go full-time with your business?